Tom Layne’s major league career is just 157 pitches old. Typically, this is not great news for a 27-year-old. 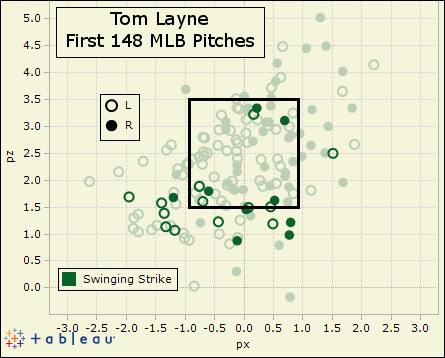 Layne, however, has put together an exemplary 157 pitches to open his time in the big leagues. Following a one-out save Wednesday night, Layne sits with a 1.74 ERA and a 17-to-1 strikeout-to-walk ratio in his first 10.1 major league innings. Even Layne’s two runs allowed only scored after a new Padres pitcher allowed the inherited runners in. Layne was acquired from the Diamondbacks on May 2nd for “future considerations,” then a career minor league starter coming off a 6.21 Triple-A ERA in his age-26 season — essentially defining the “org guy.” Layne started with the Padres as well at first, rattling off five more Triple-A starts with a 7.77 ERA. Those struggles may have done more for his career than any prior minor league successes — by June, Layne was sent to Double-A San Antonio. He allowed 10 earned runs in his first two starts there, was converted to a reliever, and his quest to the majors began anew. Layne made 30 relief appearances for San Antonio and posted his first strikeout rate above one per inning at any level with the Missions. After June 15th, he made just one appearance lasting longer 1.1 innings. In the 17 innings he threw after that date, Layne struck out 27 against nine walks, allowing 17 hits and just four runs (three earned). MLB hitters have had an even tougher time against Layne. His magnum opus to date came in Tuesday’s contest against the Dodgers, in which he struck out Adrian Gonzalez, Matt Kemp and Hanley Ramirez in order in the 10th inning, earning the win as the Padres scored in the next frame. 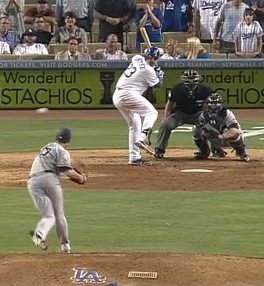 This pitch was a 91 MPH fastball that finished low and middle-in. Things are even more pronounced with his breaking balls, as they start from the same spot and end up on the outside corner (to a lefty) or even off the plate. The swinging strikes Layne generates against lefties are as we would expect — sweeping LOOGY-style pitches diving low and out of the zone. But in his first 56 pitches to right-handers, Layne has generated nine swinging strikes, a tremendous 16.0% rate, actually better than his 14.1% rate (13 of 92) against lefties. So far, Layne has done everything you can ask a pitcher — beyond his excellent whiff, strikeout and walk rates he owns a 58.8% ground ball rate as well. Regression happens, but Layne can fall a long way from his current lofty perch and still be a productive major leaguer — whether as a flexible reliever or a LOOGY — and that’s more than seemed possible for the 27-year-old just a few months ago. We hoped you liked reading Tom Layne Emerges From Padres Bullpen by Jack Moore!